82,000 miles and still have decent tread...although it's time to replace them. Really happy with these tires. I have purchased nothing but Michelin LTX for my SUVs for years, and highly recommend those tires too. But the price on the Uniroyal Laredo for comparable performance is pretty hard to beat. I have about 12,000 miles on these tires now. I have driven them in hard rain..excellent tire in the rain. We had a 4" snow recently...these tires did OK in the snow..not great..not bad. They are quiet on the highway. For this price for a name brand tire, I would buy these again. Replaced Goodyear Assurance tires with these due to poor winter performance. Took these on trip to Mount Tremblant in Quebec and they performed well in snow, ice and rain on the way up. Solid tires and good value. Good tire for the money. I purchased a set of these last year for my explorer. I have around 35,000 miles on them. I have enjoyed these tires and have not had any issues with them. I do get them rotated as needed. Great tire for the money. Would definitely buy again. Very quiet and holds the road as I go back and forth to work and the occasional 300 mile trip. Very quiet for an AT tire and durable. Really like mine and have about 40K on them. 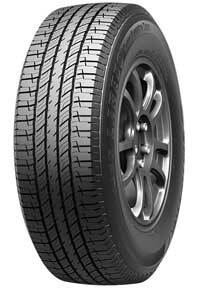 Very reliable and safe tire. My last set lasted me around 8 years. Would definitely purchase this tire in the future as needed. You might ask why would you rate this tire a 5. This Forerunner had 86,000 miles on it when the Uniroyal tires were installed. After driving in snow (SouthEast), Hurricanes and flooding in Florida, and lots of travels in between, the tires were replaced with the latest Uniroyal at 177,000 miles. The ride was comfortable and at 91,000 miles on the set of tires I have to try it again. Had about 40K miles on this set when I sold the truck and they still looked almost new. Primarily drove the truck on the highway with some city driving. Cannot beat this tire for this price.